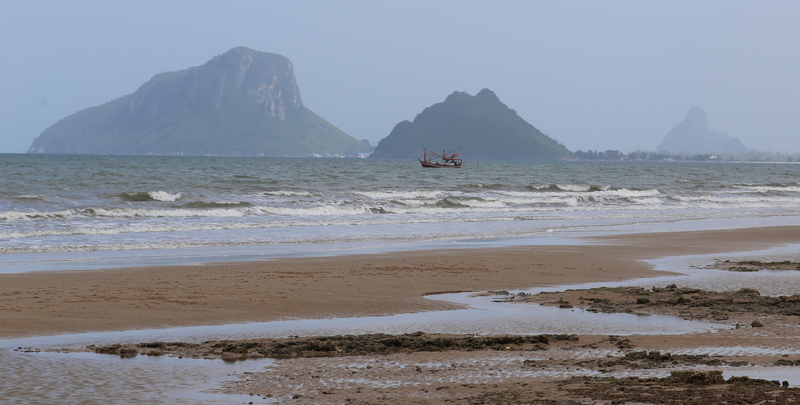 A small fishing boat crosses the horizon in Kui Buri, Thailand. Picture this: the feeling of sand between your toes, the sound of crashing waves, and the sight of a remote beach surrounded by rolling hills and vibrantly green pastures. But this vision isn’t a dream, it’s a reality. The next time you’re in need of a seaside escape, set sail for this secluded oasis. The reality is X2 Kui Buri, a boutique resort part of Thailand’s leading design hotel chain. In 2013, it was awarded a gold medal for architecture by the ARCASIA design awards. The boutique resort was also awarded 1st place in Asia Top 5 Design Hotels by Now Travel Asia. In creating X2 Kui Buri, the resort owners were determined to break the traditional tropical resort design while providing a service and experience that feeds the soul and rewards the senses. The main pool at X2 Kui Buri. Immediately upon arriving at the resort, the use of stone walls and wooden boards of Finland pine conveys a minimalistic design that is calming and reenergizing, the perfect mindset for enjoying all that X2 Kui Buri has to offer. Guests have their choice of garden, pool or oceanfront villas all of which deliver a lap of luxury. For those looking to indulge in something extra, the two-storey royal villa features uninterrupted sea views, an outdoor bathtub and a private dining area. The external stone walls of the villas appear as walls rather than buildings, which creates an invisibility of design. In other words, a structural wall for one villa appears as a fence to another villa. By using this invisibility of design, cool sea breezes are able to pass through the villa area and guests reap the benefits of a design that provides privacy without isolation. Another benefit of escaping to X2 Kui Buri is the exceptional service that begins the moment guests arrive and are greeted with a refreshing welcome drink. Unobtrusive and friendly, the resort places high importance on catering to their guests’ needs. A key example of this is the “What ever time” concept, allowing guests to check in and check out of their villas at a time of their choosing. For those looking for more than relaxation, X2 Kui Buri offers engaging interactive experiences. Whisky tasting, fishing and sightseeing are just a few of the activities offered by the resort. Only 15 minutes from the resort, climb the steps of Khao Chong Krachok while dodging the troop of playful monkeys. Sitting at the top of the hill, the monastery offers exquisite panoramas of the coastline, a definite must-see. Aside from feeding the soul, the resort’s 4K bar and restaurant will also fully satisfy guests’ cravings. Open everyday at any time, the menu caters to different tastes with a collection of Thai and Western dishes. With a prime ocean view, it’s well worth waking up early to take advantage of the complimentary champagne breakfast.